Deck Mario out in some appropriately festive accessories. It's October, and you know what that means – time for shambling zombies who were once plumbers to start popping up in your favorite Nintendo games. At least, that appears to be the case with Super Mario Odyssey, as Nintendo has added the new Zombie Headwear and Zombie Outfit to the game's selection of costumes you can purchase after finishing the main story. The Zombie Outfit destroys Mario's signature outfit in Super Mario Odyssey to give him ripped overalls and a torn shirt, as well as turning his skin a sickly green. His eyes are now a ghostly white, and his hair is disheveled. 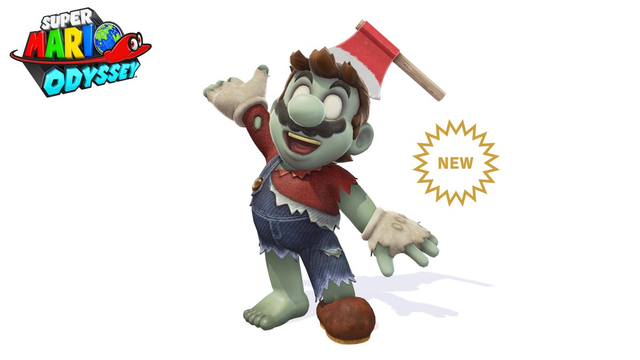 Additionally, the Zombie Headwear is, well, an axe buried in Mario's head. It completes the look. It's a pretty grisly look for Mario, but what can I say? I'm really digging it. Maybe it's scary enough to stave off even a parade of Boos since they love to stare at Mario so much. When you've outfitted Mario in his new duds, you can also head into Snapshot mode and check out the new Manga, Tile, and Kaleidoscope filters to capture Mario in his ghastly goodness. All this, and it's not even Halloween yet! Looks like Mario is raring to go when it comes to getting into the Halloween spirit.